My Piedmont editing class in 2017. My favorite job is teaching my passion — journalism. Currently, I’m an assistant professor of mass communications at Piedmont College. I also serve as advisor to the student newspaper, The Roar. I love sharing my passion of journalism, freedom of speech and finding the truth with my students. My teaching style is inspired by my teaching mentor, the late Conrad Fink. He treated each class like a meeting. He never talked down to you. He talked with you. Class was a conversation, not a lecture. The goal was to get each student thinking for him or herself. He demanded the utmost respect and diligence from his students, but he showed you that same respect and diligence. If you turned in an assignment to him on deadline, he would grade it — offering enough comments and edits to dry a pen of its red ink — and return it to you BY THE NEXT CLASS PERIOD. Truly remarkable. I’ve tried my best to live up to Fink. I treat every student with respect. I treat every class like a conversation. Getting grades back the next class period — that I’m still working on. At Piedmont, I teach the department’s writing courses, as well as public speaking and photojournalism. I’m pumped about teaching a sports communication for the first time next spring. As a public service faculty member at the University of Georgia, I taught undergraduate and graduate courses at the Grady College of Journalism and Mass Communication. In addition to my regular classes, I have taught workshops to high school and college students focusing on web writing, media law, sports writing, editorial writing, media literacy and leadership. 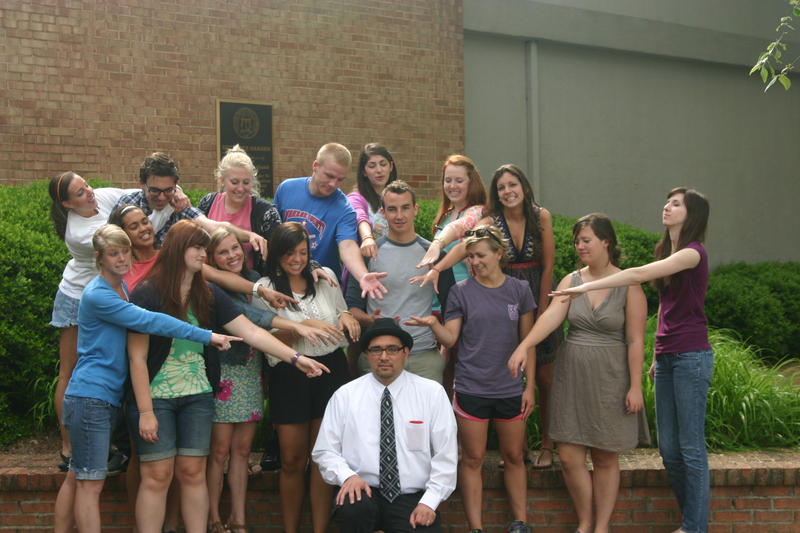 My spring 2011 editing and production students hail the fedora (or laugh at it).